Is a sharps container required in each Dental Office operatory? To be compliant with OSHA guidelines, the answer is yes! Clinical employees should be disposing of soiled sharps in all operatories “at the point-of-use”. All used sharps (needles, carpules, damaged instruments and extracted teeth) which are contaminated with blood or saliva should be treated as if infectious. 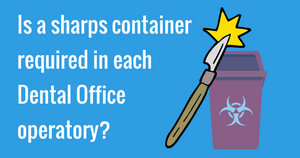 Sharps containers in your dental operatory should be part of your Engineering Controls and Work Practices per OSHA’s Blood Borne Pathogens Standard. Not only are sharps containers required in each treatment room, so are small red bags. The logic here is to reduce the re-handling of any type of soiled waste, be it soft or sharp. It makes sense, disposing of soiled waste at the point-of-use immediately reduces the risk of infection and injury to the employee. So, it becomes clear: employees cannot walk around or re-handle any soiled waste. Taking this into consideration, how do we accomplish this end without creating countertop clutter? Let’s face it, no one wants do have ugly red containers screaming biohazard in their operatories. Most times we want our ops to be relaxing and serene as well as aesthetically pleasing. We don’t want them to look clinical and potentially infectious, reminding patients of an uncomfortable hospital setting or worse. In recent years, dental offices have gone to great lengths to create the feel of a “day spa” not a biohazard wasteland. How can we be compliant without sacrificing a peaceful, calm, aesthetic environment? While these sharps containers (and small red bags) do need to be present in the ops, they don’t need to be visible. Placing them in a cupboard is an easy way to keep employees safe and keep your operatory looking pretty. Another alternative is to have custom-cut, drop down disposal portals designed into your countertops. (Speak to your dental supplier to get a quote on this aseptic dental operatory feature). So, the advantages are clear. So is the law. If you have not yet done so, make sure you place a small sharps container and red bag in each of your treatment rooms. The benefits outweigh the risk. Just do it!